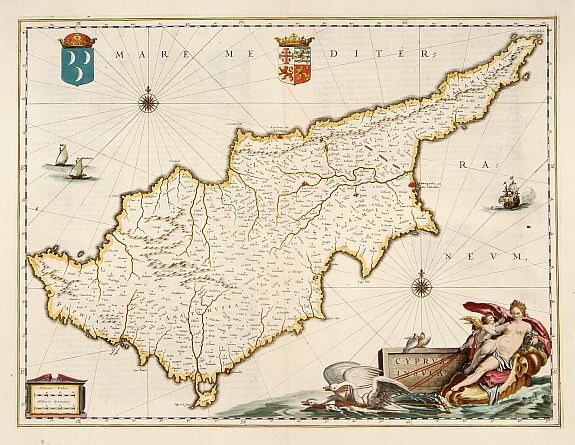 BLAEU, W. - Cyprus Insulae. Cyprus Insulae. - BLAEU, W.
Size : 15.0 x 19.8 inches. / 38.1 x 50.3 cm. Description :Blaeu's beautiful map of Cyprus embellished with a very decorative title cartouche, a scale cartouche, two coats of arms, two wind roses and three sailing ships. Condition : Paper slightly washed, colours freshed-up. Repair of split lower part centre fold. Good condition.